Three Fresno residents are accused of using fraudulent checks in San Luis Obispo County that have resulted in local businesses suffering $160,000 in losses, with another $150,000 in losses expected, according to SLOPD. Officers located the suspects in San Luis Obispo on Wednesday and found them with a 3-year-old girl and methamphetamine. On Tuesday, SLOPD began receiving complaints from local businesses about two males and a female who had been passing fraudulent checks throughout the city. One of the victims provided police with a license plate and vehicle description, and investigators also received photos of two of the suspects at the SLO CVS store. The following day, officers tracked the suspects’ vehicle to a motel parking lot in the 1500 block of Calle Joaquin. Officers conducted a traffic stop and found evidence of fraudulent check manufacturing inside the car. Police arrested Lamont Taylor, 37, and Christine Vulich, 33 on fraud related charges. Taylor and Vulich told officers they had a room at a nearby motel, and their 3-year-old daughter was inside the room under the care of Arnold Silva, 30. Investigators entered the room to check the welfare of the child and found Silva unresponsive because of drug use. The toddler was present and alert, but was found to be in extremely unhealthy conditions with methamphetamine and drug smoking paraphernalia readily accessible to her. Officers arrested Silva and took the girl for an emergency medical evaluation. Police then placed the girl in the custody of Child Welfare Services. Detectives found additional evidence in the motel room linking the suspects to check fraud cases in both San Luis Obispo and Atascadero. 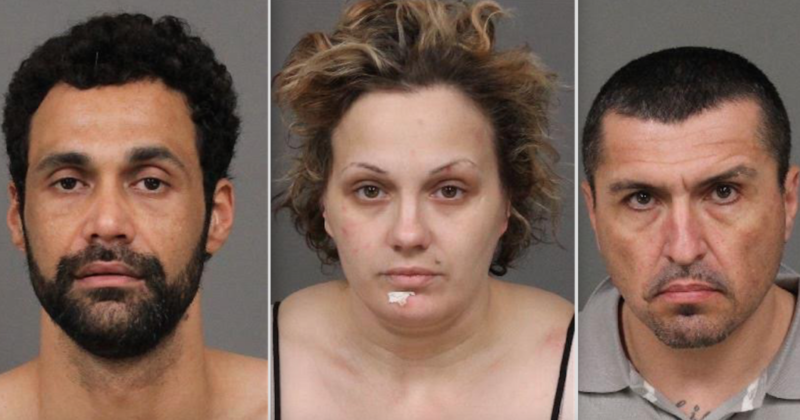 Police booked all three suspects in San Luis Obispo County Jail. Investigators request that anyone who has information about the case call the police department at 805-781-7312 or Crime Stoppers at 805-549-STOP. Such disgusting humans. if you want to call them that! What the hell did they pay for that amount of money using checks, and what business would allow that with calling a bank first? I hope they never get to see that child again, but then, we are talking about Corruptifornia rehabilitating its poor and unfortunate citizens. Note to self: avoid Fresno. Could have been Larry, Moe and Shemp. It’s time to start giving Mexico some payback. Force these idiots and their child (no fault of her own but she is destined to be a loser for life) to the other side of “The wall”. Give mexico some of our best and brightest as they do for us. Are you that desperate for an excuse to justify your prejudices that you automatically assume anyone dealing with drugs or other criminal activities is “Mexican?” Take a second look at the names and photos. Only one of the three looks like he might be Hispanic and his first name makes me think that he was probably born in this country. Scumbags they may be but they are examples that such people are not limited to any race/ethnicity/nationality.